The path of the Sun, which is known as the ecliptic is divided into twelve divisions of thirty degrees each. The common Sanskrit word for one of these divisions is a Rasi. Rasi means “a group, a quantity, a mass, etc.” In the context of astrology, as well as in mathematics, it refers to the quantity of 30 degrees of an arc, which posses the colorful names of the twelve signs of the Zodiac: Aries, Taurus, Gemini, Cancer, Leo, Virgo, Libra, Scorpio, Sagittarius, Capricorn, Aquarius, and Pisces. defined and there being precise and scientific methods of astrological practice which are replicable and worth following as compared to sloppy methods which are no better than imaginative guesswork. Though the intuitive astrologer can have skilled and enviable “guesswork,” his use of astrology does not fulfill the scientific requirements of replicability and techniques that can be passed down to students. The many different “traditions” of astrology have too many similarities to be considered different schools of thought. The mere fact that the Rasis go by the same names within all the different Zodiacal traditions reveals that all these “traditions” are all offspring of one much more ancient and greater tradition. While we can not go back eight thousand years to study this great tradition, nor are documents available from that time, we can go back very far in time and study fragments of information in the Rig Veda and study precise texts from 1300 BC and onwards that may help us understand the mystery of the Zodiac. Before studying Zodiacal information in these texts it is important to understand some background information. Most Vedic Astrologers claim Vedic Astrology to be 90% accurate. Yet only half of these astrologers predicted the last presidential election correctly. Is it the fault of the Astrology or the Astrologer? To its credit, Vedic Astrology makes use of Nakshatra Dasas, which allow the astrologer to see what planet is most significantly influencing the life at any given time. Simply knowing this helps an astrologer tremendously. For instance, staying up late in a motel room with an Indian astrologer with both of us laying in our individual beds and staring at the ceiling the conversation naturally turned to astrology. He asked me what Dasa I was in, to which I replied that I had just started the Moon Dasa. Before Moon Dasa is Sun/Venus Dasa, so he replied, “so in Sun/Venus you broke up with a woman?” To which I had, unfortunately, to answer yes. He made this prediction without seeing my horoscope, just knowing the Dasa. So many predictions can be made simply by the fact of knowing the Nakshatra Dasa, which are calculated sidereally from the Nakshatra of the Moon. There are also, many, many other techniques in vogue in India that are dependent only upon Nakshatras which provide accurate readings with out even examining a horoscope of Rasis. I have not seen Vedic Astrologers rely on the qualities of the Rasis to color their predictions. Is it because they are not concerned with the details that the Rasis offer, or is it due to their Sidereal Rasis not working well for this? In any case, while some accuracy can be claimed by Vedic Astrology as it is currently practiced, it can not claim 90% accuracy in its current form. Is it a problem of Zodiacs, or of something else? These days, most Western Astrologers refrain from prediction and concentrate on character instead. Not long ago, however, Western Astrologers concentrated on predictions, just as do the Vedic Astrologers and there are records of many fantastic predictions made by Western Astrologers. I have also seen predictive centered modern Western Astrologers make wonderful predictions and I have also seen them color the predictions with the qualities of the Rasis. But I have also seen them fail miserbly just as many times. When they fail, do they fail because their Zodiac is incorrect? Or do they fail because the do not use Varga charts and Nakshatras? The point is that Astrologers fail more often then they would like to admit. If we consider this in the light of the possibility that Vedic, Persian, Greek, and any astrology that uses twelve signs of the Zodiac to be the same system that is fragmented with different cultures having maintained different parts of a larger original system, then the failings of astrologers are explained. Just as an auto mechanic can not be expeted to repair any and all problems a vehicle may have with an incomplete toolbox, astrologers will miss and make mistakes so long as they are working with only the incomplete Western, Greek, Persian or Vedic Toolbox, when what they need is the complete Astrologer’s Toolbox. If such a toolbox exists, which it would seem it does due to the similarities of the different cultural systems of astrology, then we can only bring it together once the correct Zodiac, whether Tropical or Sidereal, is proven. So any astrologer with the desire to work towards the perfection of astrology, should have an interest in discovering the correct Zodiac. First of all, Rasis and Nakshatras are completely different things. Nakshatras are the stars themselves and there is no question that Nakshatras much be taken in the context of the sidereal sphere. The only question is where exactly the sphere of the Nakshatras begins, which has resulted in there being several different views regarding the correct Ayanamsa. There is no astrological truth to there being a group of stars called Aries, there being a group of stars called Taurus, etc. These names where given to the constellations in the descending dark age when man began making astronomical and astrological mistakes. The stars already had ancient true names. What falls in the modern Aries constellation is, from a point of astrological truth, the constellations of Asvini and Bharani (as per the Vedic names). These names go back to the beginning of man’s written philosophies and they were renamed as Aries, etc. inappropriately by the Greeks, as history tells it, by Hiparchius. There is no question that the stars, the Nakshatras, in astrology are to be taken sidereally. The ancient Greeks, Chinese, Chaldeans and Indians all have ancient names for their stars and stellar constellations. The starry constellations being labeled as Aries, etc. reveal a decline in the knowledge of astrology. India has always been a land of plenty searched for by other ancient cultures. (In ancient days it was, in fact, the only place where diamonds were found.) As a result of this, the culture of India has always been influenced by other cultures. In astrology, this is quite apparent. In India to this day there is a branch of astrology known as Tajika Astrology. This astrology is from the people of Tajikstan, an ancient Persian culture. In India this branch of astrology is practiced with the Sidereal Zodiac, as is all astrology in India. What is interesting is that this type of astrology is practically identical with Greek and modern astrology. The Greeks, of course, interchanged heavily with the Persians, so it is no surprise that the Persian astrology alive in India today is so similar to Greek and modern astrology. The significant difference is that the Persian astrology in India is practiced these days with the Sidereal Zodiac whereas the Greeks and Persians used the Tropical Zodiac. So it is quite obvious that the Indians, after adopting the Persian system used it with the Sidereal Zodiac and not the Tropical Zodiac as did the Greeks and Persians. Here we have evidence of the Indians using techniques that were performed with the Tropical Zodiac with the Sidereal Zodiac instead. There is a history of Hindu Astrologers practicing in both Greece and Persia. Yet both these countries used the Tropical Zodiac. So either the practicing Hindu Astrologers in these countries did not influence the Tropical Zodiac of the Greeks and Persians or else they themselves used the Tropical Zodiac. Here we have three examples of Hindu astrologers in commerce with Greek and or Persian astrologers yet the modern Hindu astrologers use a different Zodiac than do the modern astrologers that have sprung form the Greek and Persian traditions. Again the mystery is: How did cultures using different Zodiacs share their astrology? Or did they not use different Zodiacs, in which case, which Zodiac did they use? Perhaps some answers can be found by studying the available texts. The Surya Siddhanta is the greatest astronomical text written in the Sanskrit language. Surya Siddhanta provides all of the calculations required to calculate the Lagna, planetary positions, Nakshatras, etc. The legendary history of the Surya Siddhanta, though hardly believable, is quite interesting, and if there is an element of truth to it, very revealing. Legend has it that Surya Siddhanta was given by the Sun to the Asura Maya at the dawn of the last Satya Yuga, which would be approximately 6600 BC. Maya is said to have propitiated the Sun and asked for the boon of knowing the mysteries of the heavenly bodies. The Sun replied that he could not tutor him in his true form as he is too brilliant but that he would incarnate as a barbarian in the city of Romaka and give him the Surya Siddhanta. Modern scholars consider Romaka to be Rome; however, Surya Siddhanta gives the location of Romaka, along with three other ancient cities: Yamakoti, Lanka and Siddhapuri. These four ancient cities are all stated, by the Surya Siddhanta, to be located upon the equator upon the four quadrants 90 degrees away from each other. This puts Yamakoti at 00N00 latitude and 165E46 longitude as measured by today’s coordinates, though in the time of the creation of the Surya Siddhanta Yamakoti was the prime meridian and would have had longitude of zero. Lanka was placed at 00N00 latitude 75E46 longitude; Romaka at 00N00 latitude and 14W14 longitude, and Siddhapuri at 00N00 latitude 104W14 longitude. All of these fabled cities would have been placed where there is now nothing but ocean, however, at the location where Yamakoti had stood there are ancient underwater buildings and structures pointing towards a time when a city had stood there upon some island. If it is true that Surya Siddhanta was taught to Maya at Romaka, then the roots of modern astrology would be in Romaka, as without the knowledge of the Nakshatras, Rasis and planets given in the Surya Siddhanta no serious astrology would have been possible. Romaka is far off the coast of Africa and I have not heard of there being any sign of an ancient city there, but that does not mean that there wasn’t, especially if taken in light of there having been a city at the location specified for Yamakoti. If Surya Siddhanta was indeed given at Romaka, the closest culture to Romaka that we know of having practiced astrology was Egypt, which according to Ptolemy was where Greek astrology originated. How much truth, if any, there is to this legend, is impossible to tell, but it does reflect the ambiguity of astrology’s origins, and, therefore, the ambiguity of which is indeed the correct Zodiac for erecting a horoscope, the tropical or sidereal. Surya Siddhanta does not, unfortunately, specifically state whether tropical or sidereal rasis are to be used for erecting a horoscope, but what it does reveal about Rasis is very important and the foundation for further studying this great mystery. Surya Siddhanta begins its calculations with procedures for determining the different types of years. Of importance relevant to the Zodiac is the Saura year, the year of the Sun. The Saura year is marked by one Saura day being one degree of the Sun’s motion along the ecliptic. 360 such Saura days is a Saura year. At this point, the Surya Siddhanta does not state whether it is one degree of the Sun’s tropical or sidereal motion that is to be considered. As a result, astrologers in India these days consider one degree of the Sun’s sidereal motion, which is not correct and which has results in grievous calculations being done by the average Hindu astrologer. How do we know it is not correct? Because later the Surya Siddhanta states what the different years are used for and it very clearly states that the Saura Year is to be used for determining the Ayana’s (solstices), equinoxes, the seasons, the Sankrantis and solar months. An Ayana is the time when the Sun changes his direction from North to South or from South to North, which are when the Sun is at 0 degrees tropical Cancer and 0 degrees tropical Capricorn. Equinoxes are the periods when the Sun crosses the equator, 0 degrees of tropical Aries and 0 degrees of tropical Libra. So if the Saura year is meant to be used for determining these tropical points, the Saura year must be dependent upon the tropical motion of the Sun, and not the sidereal. The astrologers in India, however, are using the sidereal motion for this and thus in India to this day they celebrate the Sun beginning to move North on January 14th, when it has actually been moving North since December 21st. Sri Yuktesvar discovered this error in the late 1800’s and tried to convince astrologers to calculate the Saura year according to the Tropical Zodiac. Many astrologers thought it feasible, but stated that if such and such astrologer, who was considered the most knowledgeable astrologer in the area agreed, they would agree. Unfortunately, this astrologer was away at the time, and while Sri Yuktesvar hoped to speak with this astrologer in the future, upon returning from his journey, this astrologer promptly died and so Sri Yuktesvar was never able to present the errors to him. However, Sri Yuktesvar did predict that the government would accept the correct method sometime after his death. 15-20 years after the death of Sri Yuktesvar, the government of India brought together a group of esteemed astrologers/astronomers to sort out the calendar calculations which where a mess with different cities following different methods which resulted in different cities wanting to take their holidays on different days, which was disrupting the flow of government business. The government’s concern was that everyone agree to adopt the same parameters so that the government could run efficiently. One such agreement was the adoption of Lahiri Ayanamsa. They also agreed that Saura Year should be determined by the tropical motion of the Sun. However, even after this, the astrologers still calculate the Ayana based on the Sidereal Zodiac. The government does not care to enforce to correct use of the Tropical Zodiac for this, since everyone calculates it with Lahiri Ayanamsa, they take their holiday on the same day, and that is all the government cares about. The fact that the holiday is three weeks late and that the prayers do not have the expected potency aside, the Indians are still making this error to this day. If Indian astrologers and astronomers can make this mistake right now, what mistakes did the make in the past? Along the same lines Surya Siddhanta clearly states that the Tropical Zodiac is meant to be used for Sankrantis, the ingress of the Sun into a Rasi and the Solar months. The solar months are the same as the Rasis: Aries, Taurus, Gemini, etc. The solar months of the Surya Siddhanta are the same as the Sun signs of Western astrology, yet modern Indian astrologers incorrectly calculate the Solar months and Sankrantis with the Sidereal Zodiac, which again, Sri Yuktesvar explained as incorrect. The question is: If Solar months that have the names of Aries, etc. are to be calculated via the Tropical Zodiac, is it correct for Indian astrologers to use sidereal Rasis for erecting horoscopes? Or did they at some point make the same mistake with erecting horoscopes as they did for calculating Solar months? 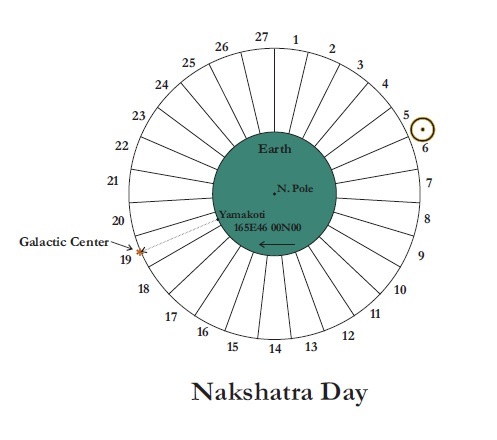 Surya Siddhanta then provides calculations for determining the positions of the planets in respect to Nakshatras. It does this first by stating that the planets complete their cycle of the heavens upon their coming to the end of the Revati Nakshatra, which is to say that the planets begin their cycle of the heavens at Asvini. The Surya Siddhanta then uses calculations involving twelve Rasis with the first Rasi, Aries, starting from the beginning of Asvini. Upon determining the positions of the planets from 0-360 degrees, the degrees are divided by 13 degrees 20 minutes (the length of a Nakshatra) to arrive at the Nakshatra placement of each Graha. At first glance this would seem to support the Sidereal Zodiac, however, we must keep in mind that a Rasi is merely 30 degrees of an arc and that Rasis were used in ancient India for all calculations involving circles and arcs, whether for astrological purposes or other purposes. Again, nowhere does Surya Siddhanta state that the calculations performed thus far are to be used for erecting a horoscope. After determining the Nakshatras of the planets, Surya Siddhanta moves on to determine the Ayanamsa, the difference between sidereal and Tropical Zodiacs. The Ayanamsa is added to the positions so far determined to convert the planetary positions to tropical positions. Once the tropical positions are determined, Surya Siddhanta provides the calculations for determining declinations and, most importantly, the Lagna. These things can only be calculated with the Tropical Zodiac and are impossible to calculate with the Sidereal Zodiac. Whereas the modern procedure is to calculate the Lagna with the help of the Tropical Zodiac and then convert it to a sidereal position, Surya Siddhanta converts the positions of the planets to tropical and then calculates the Lagna. Nowhere does Surya Siddhanta then state to convert the derived tropical Lagna to a sidereal Lagna, the Lagna remains as it is as a tropical Lagna. This would seem to support that the Tropical Zodiac is to be used for erecting horoscopes, unless the reader is meant to “obviously” convert the Lagna to a sidereal Lagna. Furthermore, in all the calculations that can only be calculated with tropical positions, such as declination and the Lagna, Surya Siddhanta uses the same 12 Rasis with the same names, but starting with Aries at the Vernal Equinox instead of Aries at the beginning of Asvini. No wonder the correct Zodiac is confused. An unbiased study of the Surya Siddhanta reveals greater importance given to the tropical Rasis, at least in the context of Solar months. Since it does not clearly state, “Use this or that for erecting a horoscope.” it would be presumptuous to lay claim to the Tropical Zodiac or the Sidereal Zodiac being the correct Zodiac for astrological use without further investigation. Vedanga Jyotisha is a very important text that is an appendage of the Yajur Veda. It is largely because of the Vedanga Jyotisha that astrology is considered a Vedanga, limb of the Veda. Vedanga Jyotisha gives the directions with which to determine those important things necessary to time the religious events of the Vedic culture such as the Tithi, Nakshatra, Muhurta, Ayana, etc. Nowhere does Vedanga Jyotisha use Rasis in its calculations. This has caused some scholars to believe that Rasis are a recent introduction into India via the Greeks. The Vedanga Jyotisha does, however, consider the twelve Solar (tropical) months just as does the Surya Siddhanta. The greatest influence upon Vedic astrology as practiced in this day and age is that of Varahamihira, circa 500AD. Varahamihira’s work is largely based on the two Yavana works, Yavana Jataka of Sphujidhvaja and Vriddha Yavana Jataka, both of which predate Varahamihira by some 300-500 years. Both these Yavana works are held in high esteem by later Hindu authors of astrology, who quote and refer to them often. Thus much of the Vedic astrology practiced today is the result of the influence of these two Yavana works. Who exactly the Yavanas where is not agreed upon by all scholars, however, there is general agreement that they were somehow related to the Greeks. Some believe the Yavanas were the Greeks that had commerce with India during the time of Alexander the Great, while others claim that the Yavanas were Greeks that settled in northern India and who became Hindus, studied the Hindu astrology and wrote masterful texts on the subject. The later is more likely the case as the author of Yavana Jataka claims that the science of astrology was given by the Asvins, which would not likely be a believe that an orthodox Greek would have had. Varahamihira states that the Yavanas embraced the science of astrology, mastered it and thus we (the Hindus of his time) should now be willing to learn from them. In any case the facts reveal that the Yavanas had at least some Greek heritage, that the Yavana influence upon astrology in India is great, and that the Yavanas studied the astrology of the ancient Indian masters. There are, however, no fully extent natal astrology texts that scholars have managed to date before the time of the Yavana texts, and this has caused some scholars to believe that Rasis were first introduced into India by the Yavanas – the Greeks. However, there are remnants written by the ancient masters from the period of perhaps 300 BC and older that reveal the use of Rasis before the Yavana texts. These are known as the Vriddha Karikas and they notable mention Rasi aspects. 29. The solar half (of the Zodiac) begins with Magha (the first naksatra in Leo); the other half, the lunar, with Sarpa (the last naksatra in Cancer). The Sun gives the (Zodiacal) signs to the planets in order, the lunar signs (are assigned) in reverse order. 30. One should find that the northern course of the Sun begins at the beginning of Capricorn, and the southern course at the beginning of the fourth sign (Cancer); the first equator (crossing) in the year is at the beginning of Aries, the second at the beginning of Libra. Yavana Jataka clearly refers to the Equinox as the beginning of Aries, so the Tropical Zodiac is mentioned. These two contradicting Sutras reveal that the Yavanas, considered as masters in astrology by Varahamihira, had no knowledge of the precession of the equinoxes, which means that they had no knowledge of the possiblitity of a Sidereal and Tropical Zodiac. The question is, did the Yavanas belive they were using the Sidereal Zodiac without the knowledge that there was a precession and no Tropical Zodiac, or did they believe they were using the Tropical Zodiac, again, with no knowledge of precesion and or any knowledge of a Sidereal Zodiac? There is no way we can know, we can only now that they were not aware of the precession of the equinoxes. Placed at the center of the sky, the glorious Sun, the lord of the luminaries, warms by its heat and illuminates by its light the three worlds. By slow, swift and regular marches, known by the names Uttarayana (the Sun’s Northern movement), Dakshinayana (the Sun’s Southern movement) and the Vaishuvata (movement across the equator at the equinoxes) and rising higher, going down and taking a mean position, respectively, whenever and wherever such positions are inevitable, the Sun, while passing through the signs of the Zodiac from Capricorn onwards lengthen the days while shortening the nights and vice versa and brings their duration on a par. When the Sun transverses the signs of Aries and Libra, the days and nights are of equal length and when it transverses the five signs from Taurus onwards days become longer and longer only while nights become shorter by 24 minutes each month. When the Sun traverses the give signs from Scorpio onwards days become shorter and nights longer. Days grow in length till the Sun takes to the southern course and nights become longer and longer till it takes a northward turn. The wise speak of the chariot (of the Sun) as having one of its wheels in the shape of a year, twelve spokes, a rim with six segments and a hub with three pieces joined together. The twelve spokes are the 12 Rasis, the rim with six segments is the six season, which are measured by the tropical movement of the Sun (as per Surya Siddhanta) and the hub with three pieces is the division of the Zodiac beginning with the Fire signs – Aries to Cancer, Leo to Scorpio and Sagittarius to Pisces. The Rig Veda has a similar description. On the right side of the dolphin whose body lies coiled from left to right they locate the Nakshatras that mark the northern course and those marking the southern course on the left side, as on both sides of a dolphin whose body is disposed in concentric rings the parts are equally divided. At its back is placed the Ajavithis and at its belly the Milky Way. One should locate Punarvasu and Pushya at the right and left loins, Ardra and Ashlesha at the right and left hind legs, Abhijit and Uttarashadha at the right and left nostrils, Sravana and Purvashadha at the right and left eyes, Dhanishtha and Mula at the right and left ears respectively and the eight Nakshatras from Magha onwards marking the southern course at the ribs on the left side and even son one should place the other eight marking the northern course, Mrigasira and so on at the ribs on the right side in the reverse order and locate Shatabhisha and Jyeshtha at the right and left shoulders. The Nakshatras are related to the northern and southern course of the Sun just as they are in the Yavana Jataka, so the scribes of the Srimad Bhagavatam were not aware of precession. Many would like to think of this great Purana as flawless, and have thus come up with the theory that Nakshatras should also be determined by tropical measurements and have Asvini starting at the vernal Equinox (0 degrees tropical Aries), however, ancient texts are very clear in stating the position of the solstices and equinoxes in relationship to the Nakshatras and so it is obvious that the Nakshatras are to be taken sidereally. Anyone who takes Nakshatras tropically is ignoring statements made in much more ancient and authoritative texts and has only looked into the subject incompletely or with great bias, and not as a scholar. the end of the Dvapara Yuga. Many Hindu scholars declare this to be in 3100 BC. However, Sri Yuktesvar has made a very sound case against the Yuga calculations in vogue. According to Sri Yuktesvar’s calculations, the Dvapara Yuga would have ended in 701 BC, and thus the composition of the Srimad Bhagavatam is not as old as many would like to believe. Srimad Bhagavatam, like most Puranas, was not scribed until after the 1st century AD, and it is impossible to know what may have been added that was not there in the original composition. 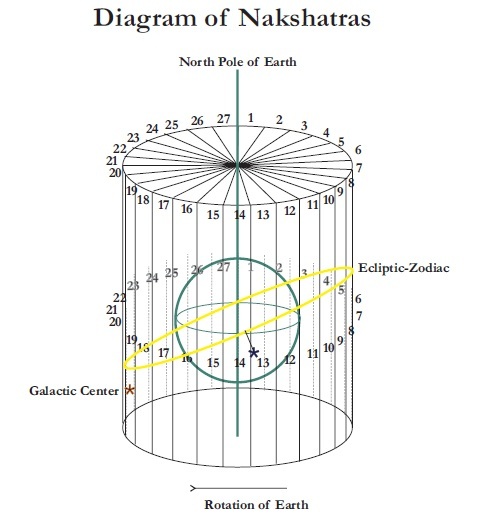 It is not likely at all that the great Vyasa could have made a mistake in relating the Nakshatras to the Tropical Zodiac when he composed the Srimad Bhagavatam when all philosophical texts before that time mention the Nakshatras in relationship to the sidereal circle only. At the time the Srimad Bhagavatam was scribed, the Sidereal and Tropical Zodiacs were close to conjunction and so it is likely that this was an interjection into the Srimad Bhagavatam in accordance with the current understanding, which Yavana Jataka and Varahamihira reveal to us as being an understanding that did not include the knowledge of precession. Varahamihira was considered the wisest man in Avanti (now Ujjain), the intellectual center of old India. Varahamihira’s texts are very revealing about the Indian understanding of the Zodiac circa 500 AD. 20. When the Sun and the Moon plus ten Nakshatras amounts to six Rasis it is called Vaidhrita, when it amounts to a complete circle it is called Vyatipata, the time (of Vaidhrita and Vyatipata) is to be ascertained by means of the degrees passed through by the Sun and the Moon. quantity to be added to the longitudes of the Sun and Moon amounts to the degrees of the Sun’s greatest declination, then the Vyatipata takes place when the sum of longitudes of the Sun and Moon amounts to half a circle. 23. The equinoxes occur at the beginning of Aries and Libra, the Shadashitimukha within the degrees of that Rasi which precedes Libra, those solar days which remain from the Shadishitmukhas are the days of the fathers. degree of Gemini, the 22nd degree of Pisces and the 26th Degree of Sagittarius. 25. The northern course of the Sun begins from the first point of Capricorn, so also the solar season beginning with Sisira. Each season extends in time over two Rasis. The Southern course of the Sun begins from Cancer. 28. For them, the first point of Aries is constantly the ecliptic point on the horizon, and the Dreshkana as well as the Trimsamsa, the Navamsa and Dvadasamsa all belong to Mars. Here we have a clear reference to the Tropical Zodiac used with horoscope calculations, as the Dreshkana, Trimsamsa, Navamsa and Dvadasamsa are horoscope specific calculations, which he relates to the Tropical Zodiac. In light of what is written in Panchasiddhantika, Varahamihira no doubt used the Tropical Zodiac. His other works, however, do not confirm this. Here we see a clear reference to the Nakshatras having a sidereal basis and Varahamihira taking the Rasis tropically and surprisingly, he seems confused by the fact that the ancient texts had the northern and southern courses of the Sun marked by different Nakshatras. This Sutra would incline us to believe that Varahamihira was not aware of precession. It does indicate that he used the Tropical Zodiac, but did he do so on purpose, or by accident? Here Varahamihira relates the beginning of Aries to Asvinni, which refers to the Sidereal Zodiac, or, if he had no knowledge of precession, to the Tropical Zodiac. Varahamihira’s works have apparent contradictions. Perhaps this can be explained by his views changing over the years, in which case, which were his latter views. It seems that Brihat Jataka was written before Panchasiddhantika, which was written before Brihat Samhita. In any case, it is not clear enough to determine whether Varahamihira believed in the tropical or Sidereal Zodiac. There is more evidence that he was not aware of precession. And there is no doubt that he used the Tropical Zodiac, but he may have done so believing that he used the Sidereal Zodiac, since at his time the 1st point of Aries was relatively aligned with the 1st point of Asvini. The Greeks themselves where aware of precession at this time, evidence of which is in Ptolemy’s Almegast, which was the astronomical bible of the western world from the second century AD onwards until the time of Kepler. This time period of from 100-600 AD is the crucial time, for during this time the vernal equinox in its precession arrived at the first degree of Asvini, which only happens once every 24,000 years. This is the period during which the sidereal and Tropical Zodiacs could, and obviously did, become confused. The very fact that the Greeks were aware of precession at this time and that the Indians were not, points to a greater possibility of the Indians making mistakes in their calculations. One such mistake has been the miscalculation of the Saura year and, as a result, of the Solar Months, Sankrantis and Ayanas, as mentioned previously. The most important question is, however, did the Indians also make the mistake of adopting Sidereal Rasis when they lost sight of precession? To the planet with Ayanamsa add the Khanda that corresponds to the Rasi. If tropical positions were used for erecting the horoscope, there would be no need to convert the planet to tropical position by taking the planet with the Ayanamsa. The fact that we are instructed to take the planet with Ayanamsa points towards the planet being in its sidereal position. Most scholars consider Brihat Parashara Hora Shastra to be of relatively recent origin, at least the version available to us now. There are several chapters of Brihat Parashara Hora Shastra that are amongst the best available in the astrological literature, but also several chapters that have obvious signs of corruption when compared to the ancient Upadesa Sutras. Since there are obvious signs of corruption and since the compilation that we have available to us may have been composed during the period following the 13th century, when everyone in India definitely used the Sidereal positions of the planets, to make a decision on the correct Zodiac based on this one Sutra when other texts point towards there being no understanding of precession during the five to six hundred year period of the Yavana texts and the scribing of the Srimad Bhagavatam would be presumptuous. However, it can certainly be chalked up as a mark towards favoring the Sidereal Zodiac for erecting horoscopes. 1. From the beginning of Aries to the end of Virgo is the northern half of the ecliptic. The other half from the beginning of Libra to the end of Pisces is the southern half of the ecliptic, both deviate equally from the equator. 2. The stars, the planets, the Moon, the nodes and the Sun wander on the ecliptic forever. Stars wander on the ecliptic only due to precession. Aryabhatia, seems to have known of precession and relied on the Tropical Zodiac, yet, modern Indian astrologers do, and have for several centuries, used the Sidereal Zodiac for Rasis. How could these differences have come about? Because of the special quality of power in the twelve places of the orbit around the Sun, those places and the stars corresponding to it have been designates as the twelve signs of the Zodiac by astrological scholars and they ascribed the qualities of certain early creatures and other things to those signs and called them the sign of the Ram, the sign of the Bull, etc. In that cycle of the Zodiac, the Moon, beginning on the first day of the bright fortnight, travels through six signs of the Zodiac until the full Moon, when the moon is at its furthest point away from the Sun. And again, beginning on the first day of the dark fortnight, it goes through the other six signs until the new Moon, when the Moon is at its closets point near the Sun. This moving away to the furthest point and moving back to the closest point to the Sun, having gone through all 12 signs of the Zodiac is called on lunar month. In this way, the movement of twelve signs of the Zodiac with the Sun, beginning with one and ending back at the same one, constitutes one solar year. Sri Yuktesvar states that there are twelve places of power “of the orbit around the Sun.” The Tropical Zodiac is based upon the orbit of the Earth around the Sun, the Sidereal Zodiac is based upon the motion of the Sun (or the Earth) through the heavens. He also states that the movement of the Sun through twelve signs of the Zodiac is a solar, or tropical, year. In respect to his thoughts on the Gita, Sri Yuktesvar seems to favor the Tropical Zodiac, though it must be remarked, that this is not in the context of erecting horoscopes. Sri Yuktesvar does state that the 12 places of power of the Earth’s orbit around the Sun and the stars corresponding in those places have been called Aries, etc. by the astrological scholars. And so they have, the ancient constellations have been enlarged to the larger constellations, such as Asvini and Bharani being labeled now as part of Aries. The imperceptible Vishnu, Janardana, is the Figure of Time whose limbs become unconscious as the Rasis beginning from the Ram. Earlier Brihat Parashara Hora Shastra had declared the planets to also be manifestations of Vishnu, though manifestations possessing consciousness. The Nakshatras, which are all deified, are also thought to possess consciousness, which is why they are deified. In fact, planets are also deified for the same reason; they are thought to have consciousness. Both Planets and Nakshatras move through the heavens, the realm of the deities. The Rasis, are not deified, they are unconscious and named after basic earthly creatures, not after deities. So it would not appear logical to consider the Rasis in respect to stars or to the heavens, but to Earth. The Tropical Zodiac considers Rasis in respect to the relationship of the Earth in its orientation to the Sun, they are very Earth based and so they are logically named after creatures of the Earth. The stars on the ecliptic have been given importance by all cultures practicing astrology. The Indians considered these stars in light of the twenty seven Nakshatras, the 27 wives of the Moon, all of whom are represented by deities. The Babylonian MUL.APIN considers 18 constellations falling in the path of the Moon, calling these “Gods”. The Chinese and Persians similarly had their constellations, all differeing in number and none of them being 12 in number. The Indians had their 12 Solar months; the MUL.APIN had also 12 Solar/Lunar months. Thus is a history of there being a division of the ecliptic in relationship to the stars, which in Vedic Astrology are the Nakshatras, and a division of the year into 12 parts. There is no history of there being 12 constellations of stars before Hiparchius, only divisions of the year into twelve parts. The Tropical Zodiac is nothing but a division of the year into twelve parts. It is likely, therefore, that Nakshatras are meant to be aligned with the stars and Rasis with the Solar Year. Rasis are considered to be moveable, fixed and dual. Moveable rasis are known as Rasis or change, fixed Rasis are known as Rasis of stability and dual Rasis are known as Rasis of transition. In an examination of the Sidereal Zodiac, there is no apparent reason why Rasis would have these qualities, though perhaps the astronomical reason has simply not been discovered. The Tropical Zodiac, however, reveals very clearly the nature of the moveable, fixed and dual division. At the moveable Rasis: Aries, Cancer, Libra and Capricorn, the Sun changes its direction. At Aries it changes from the southern hemisphere to the northern. At Cancer it changes from moving north to moving south. At Libra it changes from the northern hemisphere to the southern. At Capricorn it changes from moving south to moving north. (The Greeks, in fact, called these four Rasis the Tropical Signs.) When the Sun is in the fixed Rasis: Taurus, Leo, Scorpio and Aquarius its course has completed the changed indicated by the moveable Rasis and for now, its course is steady. When the Sun moves into the dual Rasis, it begins to orient itself for the change in course that it will make upon reaching the next moveable Rasi. If the Tropical Zodiac is the correct Zodiac for erecting horoscopes, one theory of how the difference in Zodiac use could have come about is that the Hindu Astrologers, who emphasized Nakshatras due to their importance in the religious and daily life of the Hindu, began to ignore precession when the vernal equinox (0 degrees Tropical Aries) lined up with the beginning of Asvini and upon the vernal equinox beginning to precess backwards through the Nakshatras, they erroneously continued to calculate Aries Rasi from the beginning of Asvini Nakshatras. If the Sidereal Zodiac is the correct Zodiac for erecting horoscopes, one theory of how the difference in Zodiac use could have come about is that as the vernal equinox (0 degrees tropical Aries) moved towards Asvini (0 degrees Sidereal Aries) the Greeks, becoming attached to the Solar Months, which are tropical and named after Aries, etc. forgot about the Sidereal Rasis. There is evidence of the Greeks knowing of precession from 300 BC to the present, while there is evidence that the Indians lost the knowledge of precession during the 1st – 5th centurys AD, during which time the Vernal equinox was close to the beginning of Asvini, so there is a greater likelihood that the Indians made the error. Thus the student of astrology should be aware of the corundum that astrology is today. Someone desiring the true knowledge of astrology must approach it with devotion, an inquiring mind and the faith that one’s desire for knowledge will be answered. This means to learn, to study, and to test that which one learns and studies. Only through doing so will we be able to practice astrology in its full glory. Unfortunately, most students of astrology approach it in a “religious” fashion. They listen, they believe and they truly do not know because they have not tested it in a through and scientific fashion. This attitude does nothing for astrology. In respect to the “Mystery of the Zodiac,” this means to learn astrological techniques fully and then to test the Zodiacs. This presents a problem, for without knowing the correct Zodiac, how can one be sure of the techniques? And if without being sure of the techniques, how can one test the Zodiac? It is a tedious matter of making small steps in both directions which allow the astrologer to slowly approach the truth. We cannot, unfortunately, reley on the available ancient texts, as there are too many ambiguities present in them. The ancient texts can only be relied upon to encourage us to test the Zodiacs ourselves and make up our own minds. With computers being available to us, we can test this better than any astrologers of the past 2000 years, better than any astrologers existing from the time that this problem of the Zodiacs originated. In respect to testing which Zodiac is correct, it is the details of the Zodiac that have to be examined. If a person is tall, we would expect the Lagna and Lagna lord of the Rasi and Trimsamsa to be in the large Rasis (Aries, Leo and Capricorn), if a person is small, we would expect small and slender Scorpio. If a person purchases a vehicle in Moon/Venus Dasa, both Zodiacs may, somehow, reveal the purchase of the vehicle. However, one Zodiac will specify a red vehicle while the other a blue vehicle. If the vehicle is red or blue, we have our answer, if the vehicle is neither red nor blue, then some other principle is out of order, perhaps the Ayanamsa is incorrect or the incorrect Dasa is being applied, and thus the Dasa was not Moon/Venus but actually something else. Tediously working through horoscope in this manner will help reveal which Zodiac is correct for erecting a horoscope. Generally I applaud Ernst for his work re-translating the ancient texts, and wrapping his mind around it all, however I disagree with his final statements. I have seen him in his video’s use specific celebrities as examples of how the tropical rasis are the correct ones, but in analyzing both systems (Sideral and Tropical) I personally find tropical to be the wrong one. For example, Ernst might show Angelina Jolie, and explain how it makes sense that she has so many planets in the 10th via Tropical Zodiac, however if he actually knew her, he would realize the placement from Sideral Zodiac makes sense given her spiritual destiny and emphasis in her personal life. Additionally I have clearly seen the nakshatra placements from Siderial Zodiac placement to be correct, by paying close attention to the ‘race’, and ‘nature’ details of a persons moon. Parashara was correct in guiding us to the Siderial system. Do you actually know her? I cannot say that I know her personally, but I can give more evidence of my assertions. This website/page has dedicated referenced information about Angelina and her spiritual situation. If you check it out you will see how there is a very strong positive link between children and her spiritual destiny. If you look at her chart from the point of view of sidereally based calculations, you can clearly see it as 5th lord Mars in the 9th house with the lord Jupiter there and her moon which is not in good dignity which is why she had trouble early on emotionally connecting to spirituality. Also note how she has 7th lord in the 12th house, so naturally she married a foreigner, in this case a British actor. Part of how one sees her as an actor is with Venus in the first, and the rashi and planetary aspect of Mars upon Saturn, which brings an engineering capability (Might be funny thinking of acting as engineering, but in truth everything that’s being filmed is engineered to come across in a specific way). I would also say another obvious example of how the Sidereal system can be see to be the correct one is in the chart of Einstein. He is an example of great 10th house situation with also 8th/9th lord in the 10th, helping him figure out what wasn’t obvious about the nature of light/energy and other things having also spiritual ramifications.